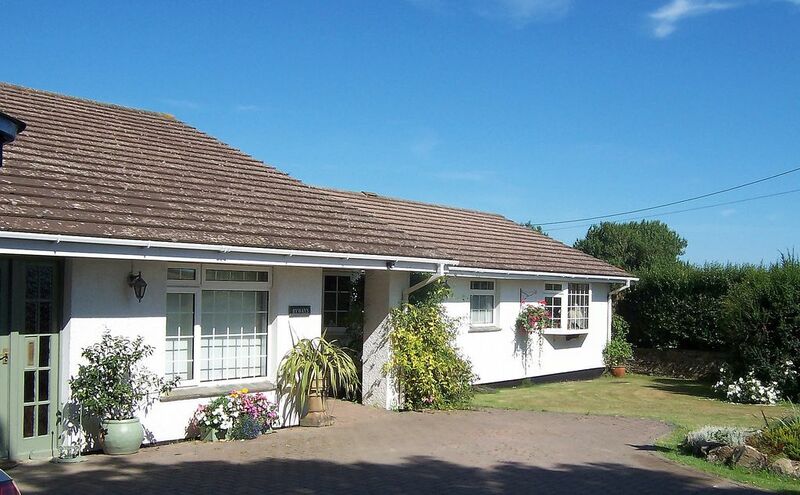 Beautiful, spacious homely property, Nr Padstow with lovely gardens & parking. Ideally situated for exploring Cornwall, Byways is a pretty whitewashed property nestling on the hillside above the picturesque hamlet of Little Petherick, and is only 2 miles from the unspoilt fishing harbour of Padstow with its famous Seafood restaurants, boat trips and the scenic Camel Trail cycle way. The beautiful sandy beaches of the stunning North Cornish Coast are only 3 miles away and offer many exciting surfing activities. This attractive family home has been welcoming guests for many years and comprises a spacious sunny sitting room, with comfy sofas and open Cornish fireplace. There are plenty of magazines and books in the bookcase, and the bureau contains local maps, walking books and holiday suggestions. (Freeview TV and DVD with selection of films) and if you are unlucky enough to have to bring your work with you, there is Wi Fi broadband. An archway leads to the dining room. (CD player with a variety of music) and bookcase.. The pine dresser not only displays pretty blue and white china but contains a selection of family games and puzzles. Double patio doors lead from both rooms to the sheltered sunny terrace with you can enjoy Al Fresco breakfasts among the pretty flowering pots. Steps lead down to the well maintained enclosed garden with water feature, lawn and shaded pergola, perfect for relaxing afternoons or evening BBQ's . A small path leads through an arch to the large enclosed landscaped garden (shared with the owners) where children can enjoy playing football etc. whilst enjoying superb rural views across to the Camel estuary. The modern light fitted kitchen overlooks the pretty front garden, and is well equipped with dishwasher, electric oven, gas hob, washer/dryer and fridge/freezer. There are two light and airy bedrooms .gently decorated in soft neutral colours, one double with washbasin, and one large family room with twin and bunk beds. One spacious bathroom has a spa bath, and the other has a walk in shower with suite. Whether your holiday is with family or friends, for beach holidays or an out of season walking holiday, Byways will make the perfect holiday retreat. Roger and Jane are both from local Cornish families and look forward to welcoming you to Byways. Byways is our family home which we live in during the winter months, so is really a 'home from home' not just a holiday property. One large family bathroom with spa bath, wc, washbasin, and another separate shower room with wc and washbasin. The delightful well equipped kitchen overlooks the pretty front garden and has a dishwasher, microwave, washer/dryer, fridge/freezer a gas hob with an electric oven. An archway leads through to the dining room (CD player with a variety of music) and bookcase. The pine dresser not only displays pretty blue china but a selection of family board games and puzzles. Famous golf courses at St Enodoc (10 miles) and Trevose (3 miles) with it's 18 hole and two 9 hole courses. Cleaning / Towels / Linen : Bed linen and towels are provided along with all cleaning materials There is also free Wi-Fi wireless internet access. We have just had ten days of relaxation enjoying the views from every window the bungalow is in a lovely area not too far frompadstow but yet far enough to give you the tranquility. Will definitely be booking again in the future. Thank you. My husband and I are from Canada, we have visited England many times, but this was our first visit to Cornwall, We were so impressed with the property, it surpassed our expectations. The bungalow was large and immaculately maintained, both the front and rear garden were quite lovely it was everything you could have wished for. As soon as we arrived Jane was there to meet us, with home made scones and Cornish cream, it was a great surprise. Jane supplied us with an in depth folder about the house and how everything worked, the folder also contained lots of information about surrounding towns and places to visit it really was useful and helped us plan our day. There is a large Tesco within a 5 minute drive of the house it has everything you could need. There is also a park and ride very close to Tesco that will take you into Padstow. We loved the local pub the Ring O` Bells great food and wonderful ambience. St Issey is a good base for visiting the Cornish countryside. We would highly recommend this property and hope to return in the near future. Spacious accommodation with lots of outdoor space to relax in and beautiful countryside views. Well equipped with everything you could possibly need. Plenty of space inside and out for relaxing. Two bathrooms a real positive - our teenage daughter loved the spa bath. The owners are attached (locked connecting door) next door. Jane was very pleasant and on hand if needed. It has to be said we found everything we needed and didn’t have to bother her or Roger all week. They were very discreet, you would never know they were there. All in all a nice relaxing stay, we would re-book if staying in this area again. Jane and Roger (hosts), were welcoming, friendly and knowledgeable. Very clean and comfortable bungalow. Enjoyed the private garden with lots of outdoor seating. Just 5 minutes drive outside Padstow, (but that ensured peace and quiet), yet near enough to get to shops, restaurants etc. If we lived nearer, we would be back! Fantastic holiday, wonderful comfortable property & lovely gardens. We were made very welcome in this lovely spacious home and thanks to great weather were able to make the most of the pretty sunny gardens, perfect for family BBQ's, we will be back! Thank you. Padstow is an Area of Outstanding Natural Beauty, famous for its dramatic coastline and wonderful sandy beaches. The picturesque fishing port of Padstow, just two miles away, offers a good selection of pubs and restaurants including Rick Stein's world renowned Seafood Restaurant. There are wonderful cliff walks and public footpaths nearby. For golfers Trevose Golf and Country Club is just three miles away. Surfing, kayaking, windsurfing , fishing, horse riding, tennis, sailing and water skiing are all available nearby. Closest golden sandy beaches are at Harlyn and Trevone (3 miles) with plenty of places to hire surfboards and wetsuits. Surf lessons, paddle boarding and coasteering are also available. Lifeguards patrol from May - September. Many more (Treyarnon, Constantine, Tregirls, Daymer etc) within a 15 min drive. The scenic Camel Trail from Padstow or Wadebridge with plenty of places to hire bikes. Newquay Airport is a 20 min drive. Bodmin Parkway Railway Station- 35 min drive. The use of a car is recommended, although there is a reasonable bus service to Padstow, Bodmin Parkway and the beaches. Eden Project- 30 min drive. Local Tesco supermarket and farm shop in Padstow (2 miles) Shops and Cinemas in Wadebridge, Newquay and Truro. Excellent restaurants/ pubs locally. The owner is happy to arrange a small grocery order for your arrival. Booking Notes: Please contact Jane if you are interested in a short break. ( 01841 540383 ) Changeover Day: Byways is available on a Friday changeover with arrival from 3pm. Departure is 10.30am. Notes on prices: On occasion we can take part week bookings- please enquire.